Size Feather Small "Set"Feather Medium "Set"Feather Large "Set"Feather X Large "Set"Teardrop Small "Set"Teardrop Medium "Set"Teardrop Large "Set"Teardrop X Large "Set"Rectangle Small "Set"Rectangle Medium "Set"Rectangle Large "Set"Rectangle X Large "Set"
Feather & Tear Drop Flags have always been extremely popular and effective. Now they are great value for money. Easy to assemble and made to withstand the Australian sun, your flag will be printed using dye-sublimation, made of top quality 110gsm knitted polyester and are double stitched for durability. You can choose single sided print or double sided - note the single sided print is still visible from behind, so simple words, such as "SALE" will be very easy to understand from all angles even if you only order a single sided print. 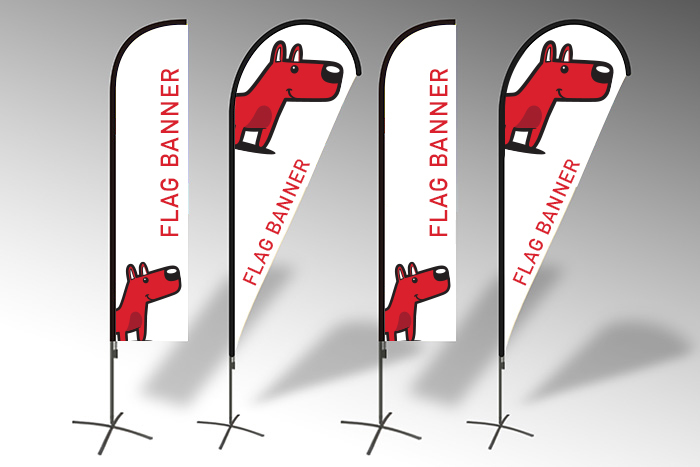 All banner flag sets come with fittings to allow you to use them on soft surfaces such as grass, and include a carry bag for ease of transportation. Extra fittings are available to allow use on hard surfaces such as concrete or indoors. There are 4 different sizes and 3 different styles, so you be sure to find exactly what you need. You should allow 2 weeks from the time of ordering for your flag to be delivered to you.